Evening all. For a few years now I have thought about finding a better camera. I am finally considering it more seriously, and would welcome any recommendations. I am looking for a camera that is small and mirrorless, has a high quality lens, and if possible a viewfinder that enables one to see the depth of field awhile adjusting the aperture. While visiting a friend last week I tried out her Sony Cybershot Rx100. It didn’t have a view finder but I found the image quality quite convincing. It has a Zeiss lens. I will visit a camera shop in Auckland where the staff is particularly experienced and well-informed, and has good quality second hand cameras. thanks for the Friday Photo OT. The sunset over Hokianga Harbour is gorgeous. Those wonderful deep colors are ones we don't see here. Went for a walk at Elkhorn Slough over the holidays. It is a huge estuary - the largest tract of tidal salt marsh in California outside of San Francisco and about 30 miles south of Santa Cruz. Beautiful place. Oak trees grow along the many miles of trails. They just cut down a big bunch of eucalyptus trees to restore the habitat of the Santa Cruz Long-toed Salamander. The second shot of the Oak covered trail looks very peaceful. Thanks for taking us along your walks. I love the shapes and lines of the Oak. The Hokianga estuary is one of NZ’s largest estuaries. The sandhills you see in the sunset photo are at the north head of the harbour and reach 600’ in height. They are an amazing sight to watch as light and shadow and ocean mist moves across them throughout the day. Do you think the depth of colour is because of its geographic positioning, lack of pollution, or what? the color here is determined by the huge bay that we live on. Both the water vapor and the reflection of the bay play a part. magical deep turquoise colors that fade into light succulent turquoises high up in the sky. Guessing that you all have more green and a smaller bay. The mouth here is about 60 miles wide. walked the Milford track many years ago. best ever. nothing can compare to the colors of the glacial stream. tending a little more to the green than the blue side. Having no nautical and questionable ability in judging distances I'm not sure how wide, but guess not much more than a mile. The estuary is 19miles long. into the workings of nature. The weather we have here at the moment is coming from the direction of the Sound and is very refreshing. mine were not digital and I would have to scan them to show them to you. The colors in the stream was bright turquoise and yellow green! blew my mind. we had three days of sunshine which was unheard of. very sore after the last day's decent 13 miles. 2500 ft down. and i was almost runnnig down. so fun. harder than the 3k feet up. and at the top. wow. I figured you'd have slides from that period. I've only seen the sound from a boat on the water. The drive down to Milford Sound was itself mind-blowing - water falling in long strips everywhere along the wavy narrow road. Travelling with our four-year-old daughter we only stopped for an hours hike through the verdant and sparkling rainforest. Check it out. Had one for years. Small and good features. Died. Sad. Probably much better now. That's one of three I'm considering, thank you. in your sunset shot Janis. Evokes a sense of distant glow. Good luck on the camera hunt. Like your little blue star too. Hi QMS, and thank you. Seems to see things differently then my own eye lens. Which is why I've always had trouble with landscape pictures. I see one thing. But the camera doesn't. Your photo looks like you combined the two. Wow! the light and colour differently. But it is designed after our eyes, which is why the camera needs a mirror or some way to turn things right-side-up, like our brains do naturally. Thanks for your comments and sentiments, zoe. we came across this pawn, looking for its chess game. Thanks for hosting Janis. Lovely sunset. That's got to be one big chessboard it's looking for. is not going any where. but it's very photogenic. and where might sir Fred be? best evening to him wherever he is. is asleep on the couch. and thank you for your wonderful photos and dedication to the POT. Would be interested in more background from your last vexillology interest, if you are so inclined ; ). I took the shot using the camera your friend has. Secondhand, for Bollox Minor's camera class. The one thing I will say about it, aside from the quality of its shots, is that I often get lost in all the various menus. Still, it sits easily in a pocket. As for the vexillology, I collect obscure flags. A little like stamp collecting, but the albums are larger. ... A little like stamp collecting, but the albums are larger. I tend to ignore all the menus if possible. I'm happy to learn to use well some simple features. Less is definitely more for me in regard to digital technology. 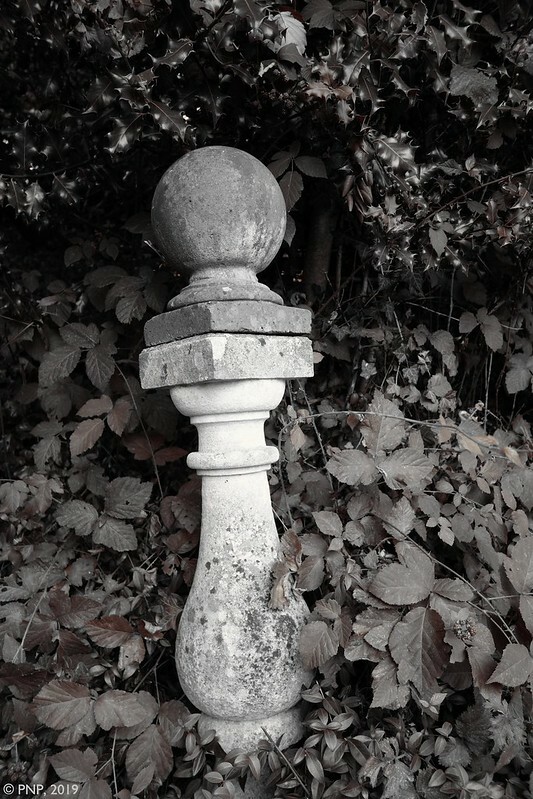 Does the camera regularly interfere with simple manual use? But should you press the wrong button, likely as not, you're confronted with all sorts of options that are of no interest. Perhaps I'm overstating it. If you're in full manual mode you should be fine. I'd so much like to find a digital camera that doesn't have a mind of it's own and is a lot less sensitive to touch. I'm guessing that in the format I'm looking for that might be impossible to achieve. I will endeavour to find one that I can make compromises with. Thanks again. Evening, Janis. Thanks for Fri. photos tonight. Very nice colors in the sunset photo. I would like to be able to give you a recommendation for a mirrorless camera but I have never used one and don't know that much about them. I do know that Nikon just released the first mirrorless cameras with a full frame image sensor, the Z6 and Z7. Early reviews on them seem to be good. It's that time of year. 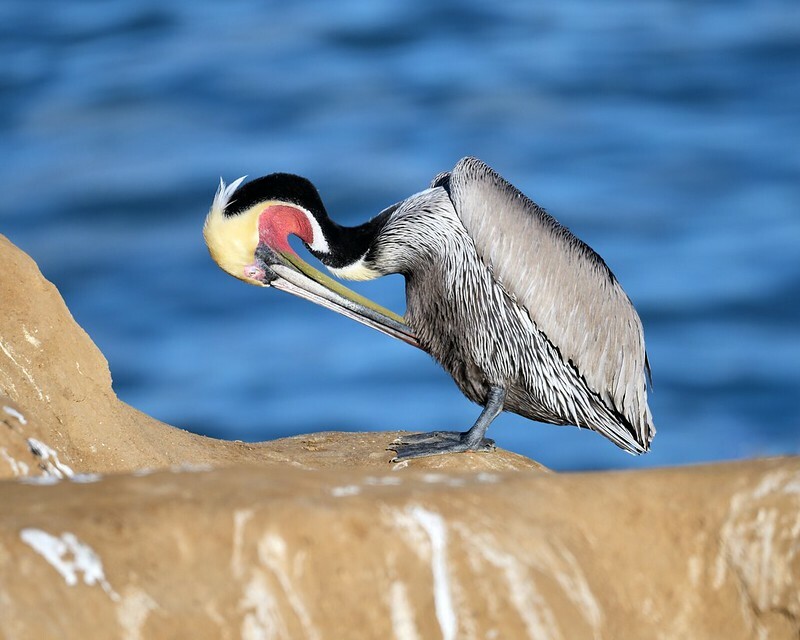 The Brown Pelicans are in their breeding colors. good evening social. beautiful mid flight shots. thanks. 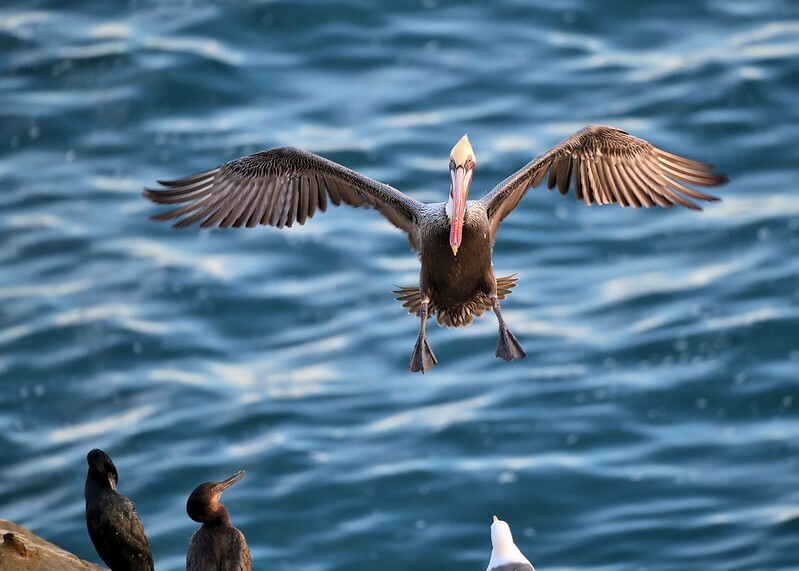 The Pelicans like to head out at first light to look for breakfast. An hour or so later when they return is a great time to get shots of them in flight. 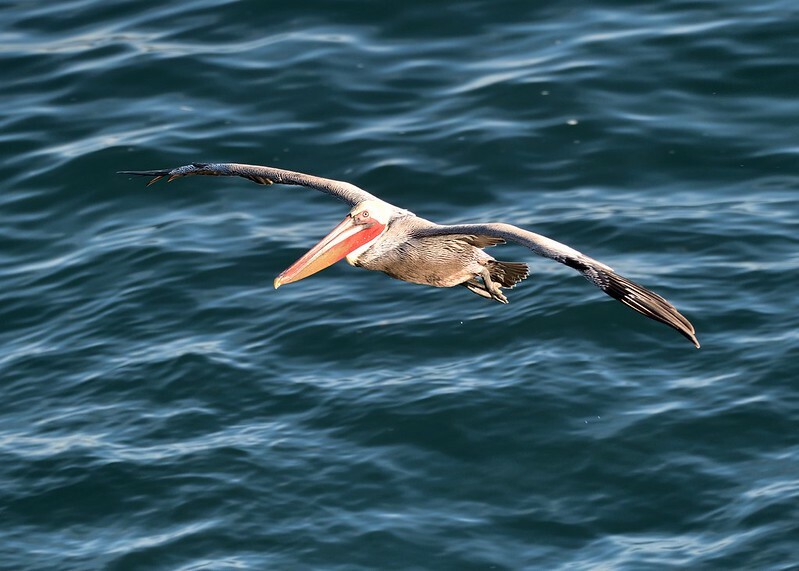 Thank you for your wonderful pelican photos. I was amazed at the youthful colour. Are they related to the ones on the east coast of Florida? If so, I'd like to try and see one sometime, but I suspect that even if they are related I'm probably not there at the right time. 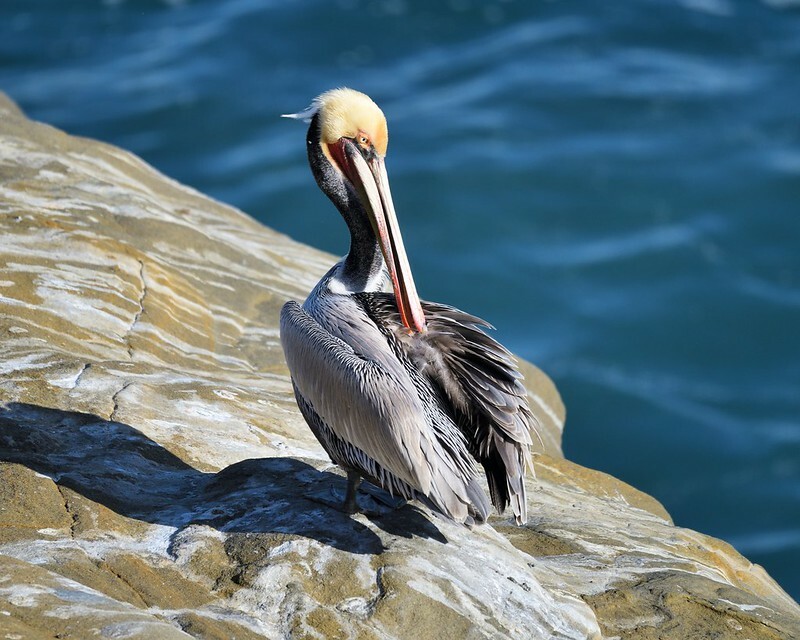 Brown Pelicans are related. Breeding season varies depending on location. I don't know what time of year the Atlantic Pelicans in Florida do their breeding. The breeding season for the Pacific Browns here in southern cal. is from January to April. 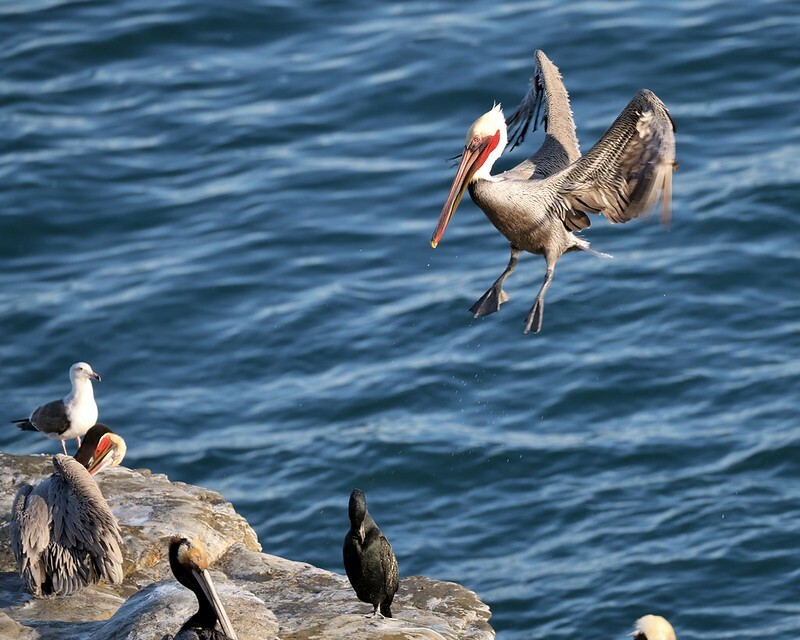 @Socialprogressive The two populations of Brown Pelicans are different subspecies. 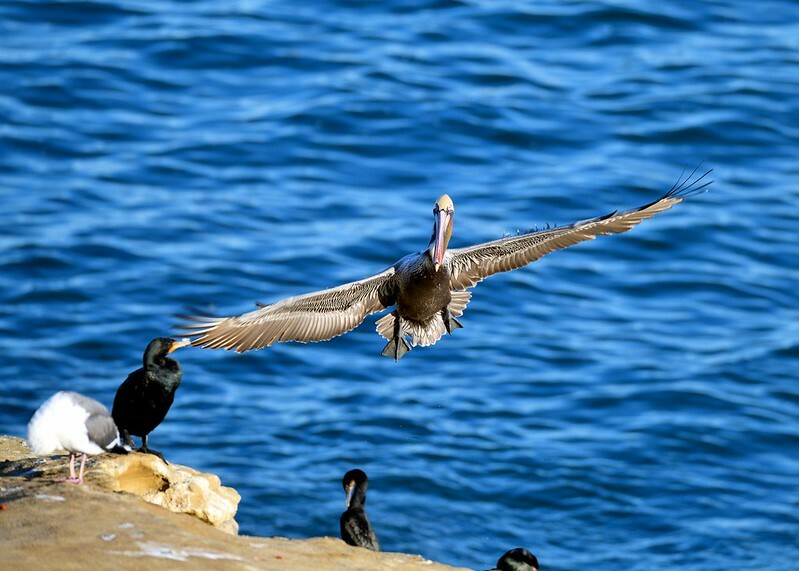 Both, or all, are Brown Pelicans. The Atlantic birds retain a brown pouch year-round and do not acquire the bright red breeding color of the pouch of the Pacific birds. They are also smaller. I looked online at the Nikon, thanks for the recommendation. As much as I would like to have a closer feel in my hands of the old Nikon FM, the camera is bigger and more expensive than what I would like. before my more regular routine begins. Watching the Tuis at the Flax Bar is about my speed. Thanks everyone for all the great posts and commets all week! Great pelicans S.P.! The Eastern Brown Pelican does not get the red like those Western ones. Love yer pawn B.R. Great sunset Janis, and great Elkhorn Slough Magi, that is a wonderful place. These are a coralimorphian which is an intermediate between anemones and corals. These are called mushrooms, which is like a large single polyp, they live in colonies, this type is called kryptonite mushroom, a small one can run a couple hun. Tridacna maxima - one of the giant clams - these are cultured for food on most islands, with some few being sold to idiots that pay 10-100 times as much to look at it in a tank. These are T. maxima clams from the Cocos Isls. Thanks everyone for all the great posts and comments all week! Your photos are worlds away from a dystopian landscape! Thank you as always, for your naturalist knowledge as well. "These are a coralimorphian which is an intermediate between anemones and corals." Do anemones fossilise and become more coral-like? @janis b I guess if they could they would. I am fossilizing myself as I get older. I think in general anemone fossils are hard to come by as there is little there but organic protoplasm, same with coralimorphians. Once you get to sponges there is often some internal calcite structure and they fossilize well. In corals there are two main groups, hard corals with the strong calcium exoskelton, most of what people think of when they think corals, and then soft corals with internal calcium structure like sponges, as in Leather corals. There is not much fossil record for soft corals, but hard corals preserved well. The mushrooms are like anemones and just dissolve and disappear. Thanks for the lesson dystopian. I feel like a sponge, happily soaking up your vast knowledge of the natural world. #7.1 I guess if they could they would. I am fossilizing myself as I get older. I think in general anemone fossils are hard to come by as there is little there but organic protoplasm, same with coralimorphians. Once you get to sponges there is often some internal calcite structure and they fossilize well. In corals there are two main groups, hard corals with the strong calcium exoskelton, most of what people think of when they think corals, and then soft corals with internal calcium structure like sponges, as in Leather corals. There is not much fossil record for soft corals, but hard corals preserved well. The mushrooms are like anemones and just dissolve and disappear. Love all the color, Dystopian. I am completely fascinated by the colors and abstract quality of the last shot of the clams. @Socialprogressive Sea World in San Diego had a couple or few two FOOT giant clams I sold them many years ago. A client said they were still there last year or year before. Those were Tridacna derasa, but spectacular amazing colors and patterns. The giant clams are incredible animals, and stunning beautiful. I think the camera you might want is the Panasonic Lumix DMC-ZS100. It has a viewfinder, a 1" chip, a Leica Lens, 10-1 zoom, is lightweight, takes fantastic pictures and even shoots 4k video. the footprints going off into the distance. The pale, cold, blue winter light in your photos is palpable. I find the composition of the first image very interesting. It is almost sliced in half by the line of the flag pole continuing through the gazebo structure itself. Thanks very much for your recommendation. It is now one of three cameras I am considering. It's hard to find one with a viewfinder isn't it? I've been looking at cameras to and haven't found even one with it. It helps me compose the image and as someone here mentioned it helps stabilize the camera. I guess that isn't as big a problem as it used to be. I thought this was a fad and it would never replace film and yet here we are in over 20 years I've gone from a 1 mpix to a 10 and now they go as high as 23 mpix. Or higher. I'm still hanging on to my Pentax film camera that has a 400mm lens and a 3x tele extender. I took this picture with it. Not too bad for not using a tripod. I need to find a scanner that allows for bigger image sizes. Anyone help me with this? There are several good options that have a viewfinder. I don't know about scanners, never operated one, but I will take a photo of a friend's work using a scanner. It's a very appealing way of creating a photographic image. I am using a bridge camera lately, which is not pro-grade equipment, but fine for internet posting. Bridge cameras are those between the deck-of-cards point-and-shoot types, and a full blown digital SLR. They are very popular with non-photographer types, most birders and butterfly folk carry one type or another around. I picked up a couple year old technology type, a Canon SX 40 cheap as a demo for a couple hun (ebay). Most of what you have seen that I have posted the last year plus is with it (the birds, butterflies, flowers, etc.). The more recent 50 and 60 models are even fancier and about 5 hun new methinks. The 40 has up to 35x zoom so can be used for birds, has macro for butterflies, takes movies, has image stabilization, and for an easy to carry package it is workable. Lots of programable features, manual modes, the auto-focus is clunky, and so is the manual focus, but workable. There are probably articles about 'bridge cameras' out there. A used one a couple years old, or a demo, can be a deal compared to new... and are nearly overwhelming at first to learn, but usage cures that. Thanks for the recommendation dystopian. The 35x zoom would be an interesting feature to have. I am considering a Canon G series camera because I once had one and loved it, but they don't have an especially long focal length. Hi Janis, thanks for FriNiPhotos. Talented group here! As to your camera question...I don't know, but my daughter is an artist that also uses photography a good bit. She doesn't know the model number she bought (typical artist?) and doesn't have here new camera with her, but, she did get a Sony mirrorless and is very happy with it. She says it is the cheapest mirrorless Sony that has a viewfinder. The more expensive ones I think just does better video. Thanks for confirmation of the Sony I am considering. Missed the fun tonight but love the photos here. Too Cool pics last night, very enjoyable. I had a chance to be out on a Friday night. This hasn't happened for awhile. Thank you all very much for your input re: my camera search. I feel a lot less overwhelmed now, and have narrowed the choices to the Sony Cybershot RX series, Panasonic Lumix ZS 100, and possibly a Canon PowerShot G series camera because I had a Canon G9 until a few years ago that I loved, primarily for it’s manual abilities. Hopefully soon I’ll be posting photos with my new camera. Your help was truly appreciated. What did you use for tonight's photos? Very nice sunset. I haven't seen one for two weeks here. And I'm going to miss seeing the bloody wolf moon Monday morning. Will you get to see it? NZ won’t really get to enjoy the wolf moon eclipse. While both North and South America, Scandinavia and the UK will get the full five-hour show, New Zealand skywatchers will only get four minutes of a partial penumbral eclipse - the hazy edge of the Earth's shadow - and to make matters worse, the sun will still be up. At 8:43pm on Monday as the moon begins to rise, a tiny slither of it will be "a little bit fainter than the rest", according to timeanddate.com - but only for Kiwis in the upper half of the North Island or Hawke's Bay. And to make things even more difficult, you'll have to be somewhere high with an unobstructed view of the horizon to see it on the horizon. I use a pocket Canon SX280. I haven’t had a better quality camera for 3 years, since my Canon G9 died. but still having problems with the battery. I can take them out and put them back in, but sheesh what a pain. It's 10 mpix as is my slr. I just don't see the need for more. Not enough unless I find that I have extra money lying around. The days may be short and sunlight is often paired with some nasty cold temps. But, because the sun is so low in the sky, you get a version of golden hour light almost all day. Ingmar Bergman's "The Best Intentions" has some utterly spectacular winter light shots. I go looking for that light every time I go outside with a camera in winter.